Looking for a stadium where would you go to? - Church Street of course! 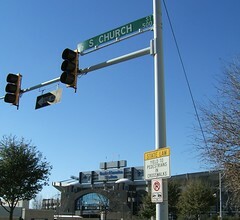 In Charlotte, NC, you exit Bank of America Stadium and go along Church Street, six blocks later you run into First Presbyterian Church, two more blocks and you are at St. Peter's Episcopal Church and another two blocks further long the road you find First United Methodist Church. What a road of sport and spirituality!